I’ve made a lot of mistakes while building my online businesses (1) Golf Practice Guides and (2) Under 30 Wealth. It took me a while, but I eventually learned that mistakes and failures are a part of the entrepreneurial journey, and learning from those experiences and overcoming their related challenges is what becoming a successful entrepreneur is all about. Overcoming challenges is satisfying and something you have to get used to as a successful entrepreneur. One mistake I made while building my online business that I wish I hadn’t made was not starting an email list sooner. I waited too long to get an email list going and it cost me. I think back now of all the traffic coming to my website that I missed building a relationship with and possibly converting into customers because I didn’t have an email catcher on my website for them to optin to and stay connected with me through email. The second mistake commonly made is not understanding your email list. Building a list is half the battle. Once you’ve built a list you have to know what to properly do with it. This was a mistake I made for a long time before finally realizing I needed to understand my audience better. I began studying the experts who taught email list building for a living. I began implementing the strategies I learned from them and soon I saw results as my list began growing each month. Now I’d love to help you get started building your email list. Let’s get started. 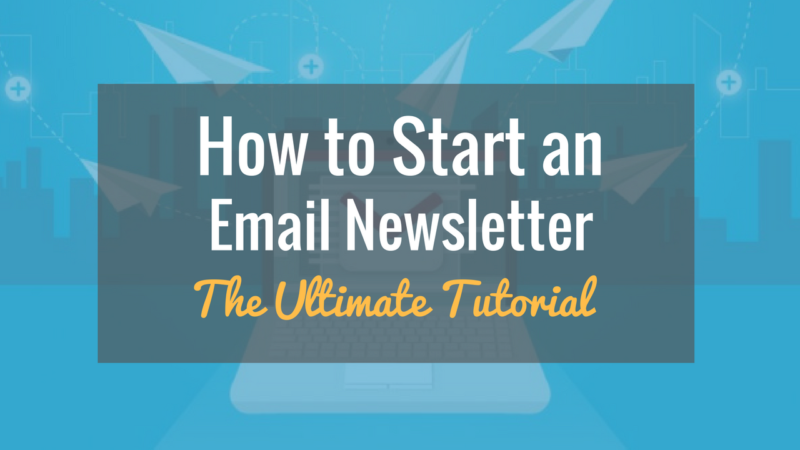 First I’m going to answer a series of common questions related to email newsletters and then we’ll get into the actual tutorial of how to set up an email newsletter. Feel free to skip the questions and head straight to the tutorial if you want to but these questions will be important to know the answers to. Also, if you want to learn how to drive traffic to your email opt-in pages to gain subscribers quickly, I’ve got an eCourse on using Pinterest to build your email list. The What: An email newsletter is something you offer reader’s of your website blog so that they can join it to receive additional content from you outside of your blog posts. Someone wanting to get updates on your next blog post being published could just subscribe to your RSS feed, but a newsletter is different. A newsletter allows you to send broadcast emails informing your list of events, giveaways, upcoming products, existing products, and more unlike an RSS feed. Why Would You Want to Offer an Email Newsletter? The Why: You want an email newsletter so that you have a tool for capturing people’s email addresses. Emails are more personal. They allow you to communicate with your audience on a more personal level and are effective at getting people to take action. Email lists never die. Once you’ve captured a list of emails, you’ll always have them and can communicate with your audience. The only way to lose communication is if they unsubscribe from your emails. You can market to this email list. If you create a product such as an eBook or eCourse or offer a service, then you can communicate the benefits of this product or service to your list and persuade them to buy. If the product or service is solving a problem for someone, then it will have no trouble selling. You have to effectively communicate how it solves a problem. Reason #3 is a big factor behind understanding your email list audience. One way to understand your audience is to ask them directly or poll them. Find out what they are having problems with and create a solution for them. For example, when I built my email newsletter for Golf Practice Guides I would send out an email introduction saying thanks for joining my email newsletter community and at the end I would ask them 4 questions to learn more about them as well as show my genuine interest in learning more about them. I found out people were struggling with their golf swing or they had trouble putting on the greens and immediately I was able to come up with new product ideas to help solve these problems and promote to my email list. What’s Your Main Goal of Your Email List? The major focus you should have on building an email list is for building a stronger relationship with your audience. You don’t want to come across as “all about money” in your emails because they can sniff it out and you’ll lose credibility and trust. People hate being sold to all day long. I’ve been part of email lists before where the guy I subscribed to just sells, sells, sells, all day everyday in every email he sends. I unsubscribed and I’m sure many other people did as well. How to Use Your Email Newsletter Effectively? You have to use your email newsletter for continuing to educate your list, sending them funny content, and sometimes informal talk not related to the usual content you send such as updating them on events in your life. People love to learn more about your life and the stories you have, which is why so many people watch reality TV shows. You just have to be careful not to update your audience on everything in your life because you’re not on a reality TV show, you are there to educate and be the authority figure of a topic or product or service that people joined your list to learn more about. Overall lesson: whatever you do online, you have to be about informing people and educating people first, not all about the money first. If you educate and inform for a series of emails and build that relationship, then you can pitch later and you’ll have a higher chance of that person buying or taking action. Does It Have to Be a Newsletter? How Often Should I Email Them? The most important lesson with having an email list is you have to consistently be in contact with your list. Don’t let them forget who you are. The most common and recommended method is to set up an automated email newsletter. An automated email newsletter is a series of emails they receive upon joining your list that you have pre-written and published to your email marketing company to send out for you. For example, with my golf email newsletter I may write a 5 email series on how to improve your golf swing and every day I send them a new tip related to the golf swing for 5 days. My email marketing company, ConvertKit, hosts the emails and is set up to send these emails out for me each day at a specified time. This way I don’t have to log in every day and see who has subscribed and send out 5 different emails to people at different stages in the series. It’s all automated and keeps track of who has received what email and what email to send them next in the series. Email Newsletter vs Mini Series? You can set up a general email newsletter that runs several months sending a new email each week to your list and then have a separate mini email series set up to educate people on a specific topic. For example, your mini series could be just 5 emails long that get sent out over a 10 or 20 day period. I did this with Ask Nick Foy by creating a FREE 7 day course on setting up a WordPress website and writing your first blog post. Every day you get a new email with the next lesson in the 7 day course. At the end of these educational mini series you could have a sales pitch email set up to offer them a product or service now that you’ve spent a mini series of emails educating them on it and have primed them. What’s the Difference Between Newsletter and RSS Feed? For busy people who love reading blogs but have to work 9-5, RSS is a great way for them to subscribe to a blog and get emailed the latest blog posts. RSS email subscriptions usually run through a Feedburner account. RSS essentially allows people to stay up to speed with your blog and it’s most recently published content. They get emails sent to them of your latest blog post to read right from their inbox making it more convenient than having to go to your website and scroll the blog looking for posts they haven’t read yet. An email newsletter allows you to email them anything you want. It doesn’t have to be anything related to your blog if you don’t want. You can use it for marketing products of your own or affiliate products of other people. You can use it for driving traffic to your website by linking to different pages or blog posts on your website. The possibilities are endless. You decide! Now onto the tutorial of how to set up an email newsletter. (1) Bob sees your form on your website offering him a free eBook on how to train for a marathon. Bob enters his email address and clicks submit. (2) After hitting submit, Bob is redirected to a thank you page with a link to download his free eBook. He is also informed he must confirm his email address by checking his inbox for an email with a confirmation link. (3) Bob confirms his email by clicking the link and is redirected to a second thank you page where he can download his free eBook again if he didn’t the first time. (4) An introductory welcome email is sent to Bob. (7) You occasionally send a broadcast email (one time email) to your list that Bob receives as a member of your list. There are many email service providers out there to choose from but ConvertKit is by far the best in my opinion and who I use for my email lists. ConvertKit allows you to create automated email series, categorize subscribers using tags, and has an automation tab where you can give the software tasks to do based on certain actions that happen. Once you’ve signed up for ConvertKit, you’ll be taken to the home page dashboard. There are 6 tabs to navigate in the menu bar above: Forms, Sequences, Broadcasts, Subscribers, Automations, and Account. Click on the tab that says Forms. You’ll see your subscriber activity for the past 30 days. 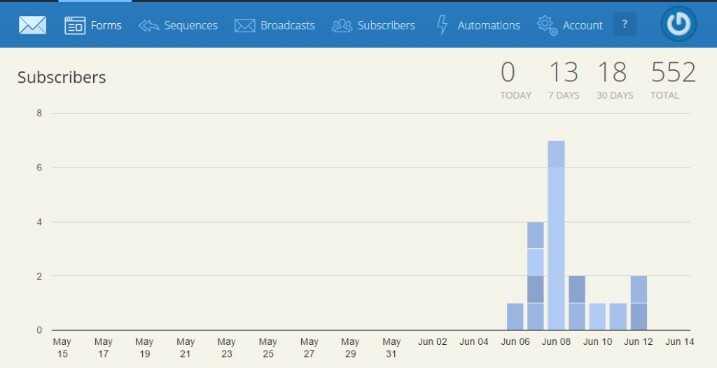 The color coordinated graphs show you how many subscribers you had each day and what form they opted-in to. This will help you better gauge where your subscribers are coming from. Then you’ll see a screen that has 3 form options to choose from: a simple headline and email form, a professional looking form with picture, and a single line form to stick into the middle of a page or blog post. Give the form a title so you can remember what it’s for. I create multiple forms usually, one for each of the major pages of my website so that I can see which page is converting best and sending the most subscribers. In the title I will put something like Newsletter (About Page) and Newsletter (Home Page). You can then assign the form a sequence as you’ll see in the bottom of the picture above. This automatically enrolls them into your newsletter series. 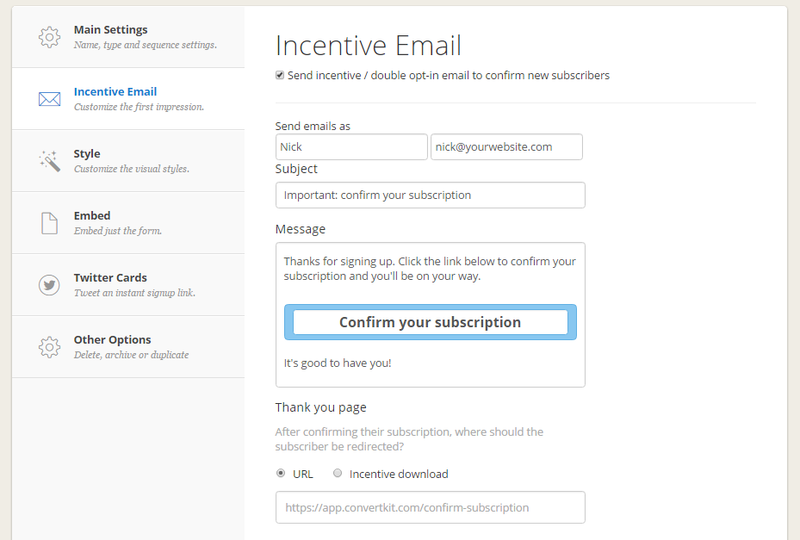 Next, click on the Incentive Email tab in the settings. You can determine the name you want them to receive in their inbox as well as the from email address. You can customize your confirmation message or leave it as is. Finally, decide if you want to send them to a thank you page or send them their incentive they get for opting into your email list. After you get done with these two main settings tabs, you can also change the form appearance in the Style tab and grab the embed code to place the form onto your website. To embed the form into a webpage in WordPress, you’ll need to copy the form code and then go into the “Text” tab of a webpage or blog post not the “Visual” tab. Paste the code in the “text” tab as this is the tab for HTML code. If you paste it in the “Visual” tab, it will show up on the webpage as just a bunch of code. You could also copy the short code which has brackets and looks something like [converkit form id] but you’ll need to download the ConvertKit plugin for WordPress for it to work. ConvertKit gives you a template to follow starting out with several pre-made emails as an example. You will of course delete the content and put in your own but it’s to help guide you as far as which email to send educational content and which email to send a sales pitch. Be sure to input how many days you want the email to wait to send after the previous email has been sent. For example, I have about 20 pre-written emails with killer content that are timed to be sent out every 7 days. It doesn’t matter when someone signs up, they will be taken though the series of emails from the beginning. I add about 1 new follow up email/message every week, just to keep content fresh and expand my autoresponder series. Check out this guide on what type of emails to write in your newsletter autoresponder series. A formal welcome and thank you for signing up for your newsletter. Any links to any free gifts or downloads that you might be giving away as an incentive for joining your email list. What the subscriber can expect in the email newsletter (for example, what your subscribers have to look forward to). Asking your subscribers to “white list” your email address so it doesn’t go into their spam or junk folder. Once you’ve created the welcome email and created several emails for your autoresponder sequence, go into the settings for the autoresponder sequence to configure them. Give the sequence a name, determine which email address will be the From email that the receiver sees in their inbox, and select which days of the weeks you want your sequence to be able to send emails. For example, maybe you only want emails delivered Monday through Friday. In this case un-select Saturday and Sunday. If you set an email to send 1 day after the previous email, it will count days based on your settings so in this case the next email would be sent out on a Monday and not a Saturday if the previous email was sent on a Friday. Send yourself a test message to make sure your email sequence is working properly, the “from address” is correct and to see how everything would appear to a subscriber who joins your list. 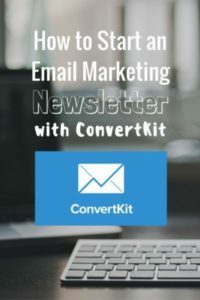 If you are moving over from an existing email service company to ConvertKit, you’ll likely have a list of email subscribers you are bringing with you. The subscribers tab is where you’ll import your CSV file. When you import the file, you’ll be able to select a form, sequence, tag, group, etc. that you want to add these subscribers to so make sure to determine ahead of time how you want to group subscribers during import. I like to group subscribers based on what skills they need to improve in their golf game for my golf email list. Then I can send them targeted emails specific to the skill they need help with and avoid sending them content that isn’t relevant to their needs. We covered the automated email series above already and this is done in the sequence tab. Automations are different so be careful not to confuse the two. Automations allow you to tell ConvertKit what to do if an action occurs. For example, if someone subscribes through a certain form, then do this. If someone on my email list clicks a certain link in an email, then do this. If someone unsubscribes from my email list, then do this. It’s a series of actions and reactions you can set up for different scenarios. In my case, anytime someone buys a product from my store page they are automatically tagged as customer. Then I set up an automation so that anytime someone is tagged “customer” to remove them from the general mailing newsletter and place them on a new email newsletter specific to existing customers. This way I don’t continue to pitch products to them in the general newsletter since they are now a customer. When you import subscribers, I mentioned how you can tag them as well which essentially places them into groups. You can also tell ConvertKit that depending on where someone subscribes, you want to give them a specific tag or group. For example, I have an optin form for the mental game of golf and an optin form for the golf swing. I can place these forms on blog posts specific to their skill they represent so if a subscriber joins the mental game optin form I know he found one of my blog posts on the mental game and is interested in learning more about this aspect of golf. He will be tagged and sent to the mental game of golf group within my email list. 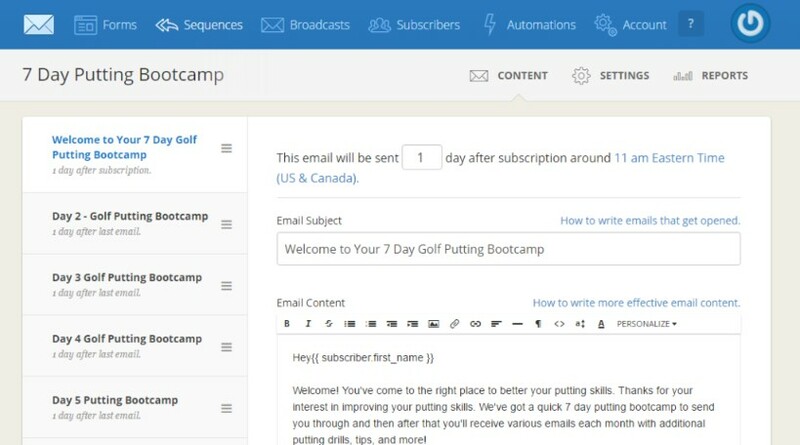 Then I can tell ConvertKit to automatically enroll them in my email sequence that has a series of emails related to the mental game of golf so that the subscriber receives specific content. If you’re confused, no worries. It’s pretty simple stuff once you’re inside ConvertKit and playing around with it for a few hours. I had the pre-conception that ConvertKit would be complex but after using ConvertKit I realize now how simple and easy this email software is to navigate compared to my old company, Mailchimp. ConvertKit is definitely the better company and makes it easier to set up my email lists and sequences custom to how I want them. You’ll want to put in a company address to comply with CANSPAM laws that require email marketers to have a physical business address shown in their emails. Usually this company address shows up in the very bottom of the email. It tells subscribers you’re a real company and not a spammer. Your API Key is the code you’ll want to copy and paste when integrating with other softwares. I hooked up ConvertKit with OptinMonster to create fancy, beautiful, and professional looking optin forms thanks to OptinMonster’s variety of email form templates. 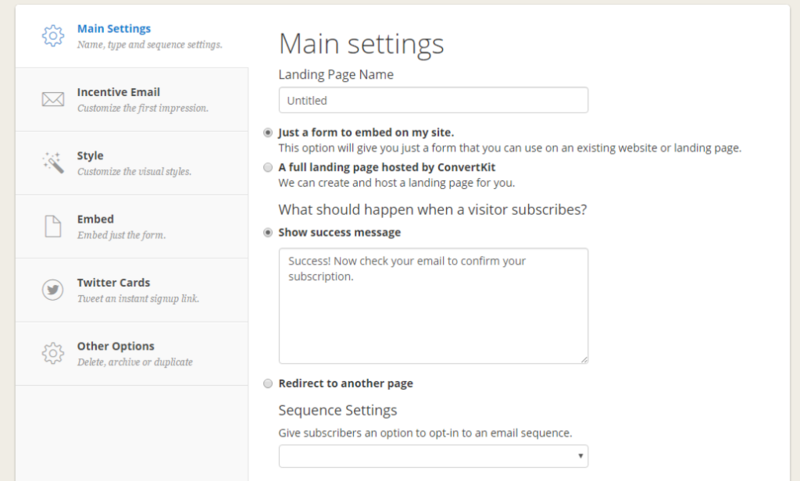 You can set the default email address and settings here in your ConvertKit account settings page, but you have the option to customize them for each individual sequence as we discussed earlier above in Step 3. You’ll also be able to see your billing plan and credit card on file for the billing plan. ConvertKit lets you have up to 1,000 subscribers for their $29/month plan before moving you up to the next plan which is up to 3,000 subscribers for $49/month. The 1,000 subscriber plan should be plenty until your list takes off. ConvertKit also knows not to count the same email twice unlike many other email service companies. This helps you stay under the 1,000 threshold and not double or triple count someone who optins to multiple email series you create or different incentives you offer for subscribing. Inform them about your top articles to read, videos to watch, podcasts to listen to, etc. Inform them of an upcoming class, webinar, or course you’ll be hosting and how they can join. Congrats on Your New Email Newsletter! You’ve completed this lengthy tutorial! I know it’s long but I wanted to create an awesome guide for any beginner’s thinking about starting an email newsletter. If you found it helpful, I’d really appreciate it if you took two seconds to share this article using the big share buttons! Your next step is to head over to ConvertKit via this link and sign up for their email marketing service. Begin implementing the tips and following all of the steps highlighted in this tutorial today. Have this tutorial open in a separate tab so you can refer back to it easily while setting up your ConvertKit account. It covers everything you need to know about email list building including lots of advanced features you can set up to save you time and grow your list on autopilot.